The spatial structure of beta-amyloid Aβ1-40 in complex with sodium dodecyl sulfate micelles as a model membrane system was investigated by 1H-1H two-dimensional NMR (TOCSY, NOESY) spectroscopy and molecular dynamic method calculations. On the basis of NOE and chemical shifts changes data, spatial structure of the complex beta-amyloid-model of the cell surface membrane was obtained. Alzheimer’s disease (AD) is a neurodegenerative sickness, which is characterized by the presence of amyloid plaques and neurofibrillar tangles in brain tissue. Products of enzymatic cleavage of a precursor peptide, amyloid precursor protein (APP)  are small peptides, 39 - 43 amino acid residues in length, called amyloid Aβ- peptides. APP is a 695 - 770 residue transmembrane protein which is found in all mammals. When APP is cleaved sequentially by α-, β-, and γ-secretases Aβ-peptides are produced. 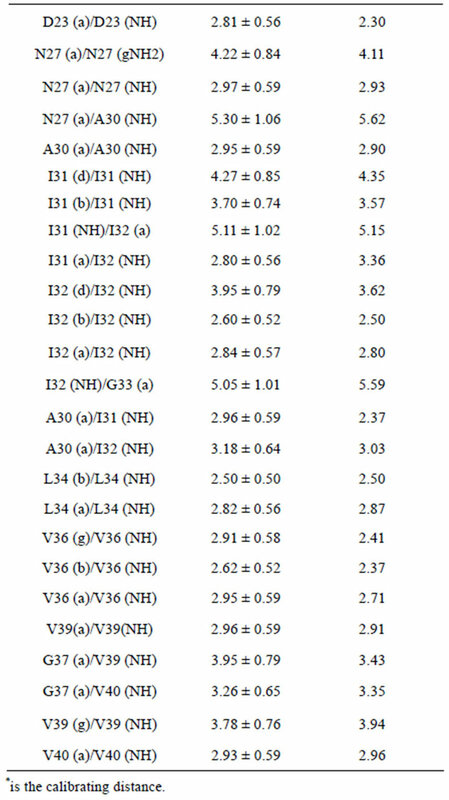 Among amyloid-β peptides, the most abundant Aβ1-40 species is the 40-amino-acid-long version (Figure 1), but several of the highly aggregationprone Aβ1-42 and Aβ1-43 are also present in amyloid plaques of AD patients. There is increasing proofs that prefibrillar intermediates and/or the fibrils themselves play a significant role in neurodegeneration [2-7]. Figure 1. 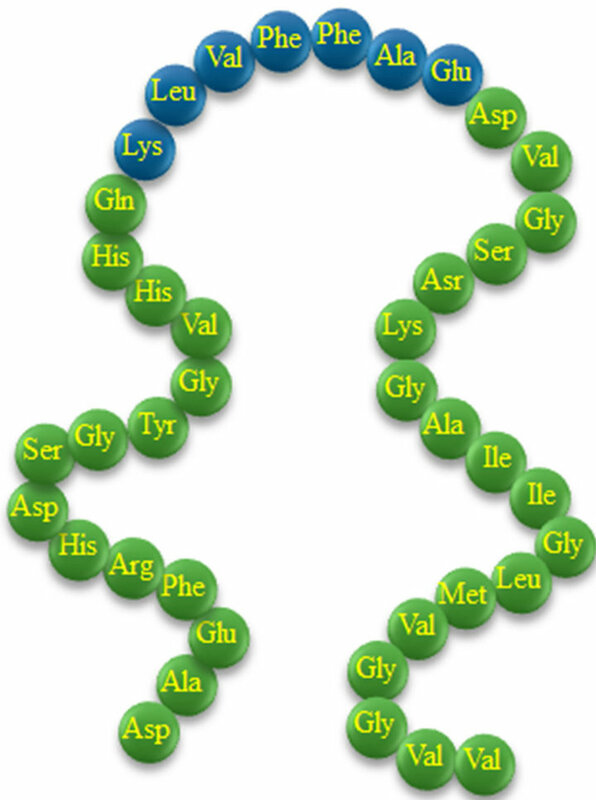 Beta-amyloid Aβ1-40 amino acid sequence (active fragment Aβ16-22 in blue balls). bio-membrane systems are of intense interest. A discription of the spatial structure of the complex of Aβ1-40 with the membrane, would provide a fundamental understanding of the mechanisms taking place on the cell surface and could lead to the discovery of inhibitors of senile plaque formation. Micelles of sodium dodecyl sulfate (SDS) can be used for modeling the behaviour of these proteins on biological membranes for small hydrophobic proteins that form complexes linking directly with the micelle of SDS. Synthetic SDS micelles, like many biomembranes, have a negatively charged surface. This charge is also influenced by the critical micelle formation concentration (CMC) of SDS. Aβ1-40 peptide was synthesized by solid-phase synthesis [10,11] using amino acids protected by the 9-ﬂuorenylmethoxycarbonyl group and with reaction mixture conductivity control. Fmoc (9-fluorenylmethyloxycarbonyl groups)-protected amino acids of “peptide synthesis” grade were purchased from Applied Biosystems, Foster City, CA, USA. Peptide synthesis was made using 0.1 mmol automated fast Fmoc solid phase procedure using HBTU (O-Benzotriazole-N, N, N’, N’-tetramethyluronium-hexafluoro-phosphate) activation [10-12]. The procedure was performed on ABI 433A peptide synthesizer (Applied Biosystems, Foster City, CA, USA) at 293 K. Separation of the peptide substrate and the protecting groups was carried out in an acidic environment based on trifluoroacetic acid. The peptide was purified using highperformance liquid chromatography instrument Series 200 Perkin Elmer HPLC System, Waltham, MA, USA. Vydac 259VHP810 column (Grace, IL, USA) was used at 323 K, water-acetonitrile linear gradient, flow rate 4 mls/min and backpressure 1400 psi. Concentration of acetonitrile in the water-acetonitrile mixture for the target peptide desorption was around 15%. The quality of the final product was characterized using MALDI-TOF (Matrix-Assisted Laser Desorption-Ionization) mass spectrometry. Purity of the peptide was estimated as better than 98%. The sample was lyophilized and stored at a temperature of 80˚C before usage. The SDS micelle solution in H2O + D2O (90% + 10%) was prepared at a concentration of 5.72 g/l. The Aβ1-40 peptide was dissolved in the micelle solution immediately before the NMR experiment. All data were acquired on a 500 MHz (1H) Bruker Avance II NMR spectrometer (Kazan Federal University NMR Laboratory). 2D NOESY and TOCSY spectra were acquired at 293 K. For each spectrum, 32 transients were collected using 16 dummy scans with spectral widths of 12 ppm in both dimensions, using 1024 complex points for F2 and 256 complex points for F1. All chemical shifts were measured from two-dimensional TOCSY spectra. The solvent signal was suppressed using 3-9-19 pulsesequence with gradients. NOESY data were collected with a mixing time of 100, 200, and 300 ms to derive 1H-1H distance constraints. Spectra were processed using standard Bruker software (TOPSPIN, version 3.0) and analyzed with SPARKY. Sequence-specific backbone resonance assignments and side-chain assignments for all residues were obtainned using a combination of 2D TOCSY and NOESY experiments as described elsewhere [13,14]. Interproton distances obtained from analysis of intensities of cross-peaks from NMR NOESY spectra with tm variation were used as the primary data for the calculations by molecular dynamics method in the XPLOR program . As a model of a biomembrane the system of Aβ1-40- SDS (in aqueous solution) was used. Micelle formation could be observed by 1Н NMR spectroscopy at an SDS concentration of more than 4.3 g/l. 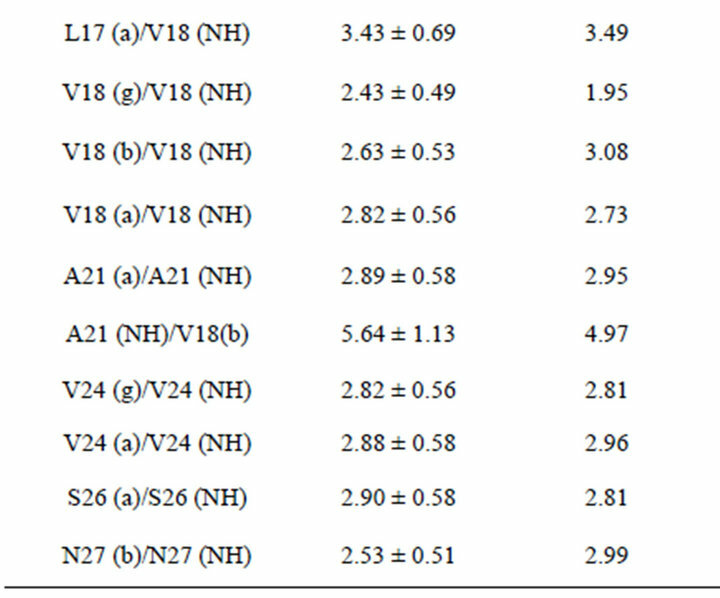 Using 2D NMR 1Н-1H TOCSY and NOESY experiments the chemical shifts of the beta-amyloid in the solution of Н2О + D2O with SDS micelles (Table 1), and in the phosphate buffer aqueous solution, were determined. Comparing them, one can see a change in these values. The difference is probably due to changes in electrostatic environment brought about by the binding of the peptide to the micelle surface. To determine the interproton distances which directly characterize the spatial geometry of peptide in solution, NMR NOESY spectra with varied mixing times (tm) were obtained. To determine the spatial structure of beta-amyloid in a solution of Н2О + D2O with SDS the molecular dynamics method of the XPLOR program was used . Chiefly there are two ways of proteins interaction with membranes: by simply permeating through the bilayer (in the case of integral peptides) and by forming a complex with lipids on the bilayer surface . Modern NMR spectroscopy methods have been more widely used to study peptides interacting with micelles than the micelles/ lipids themselves. 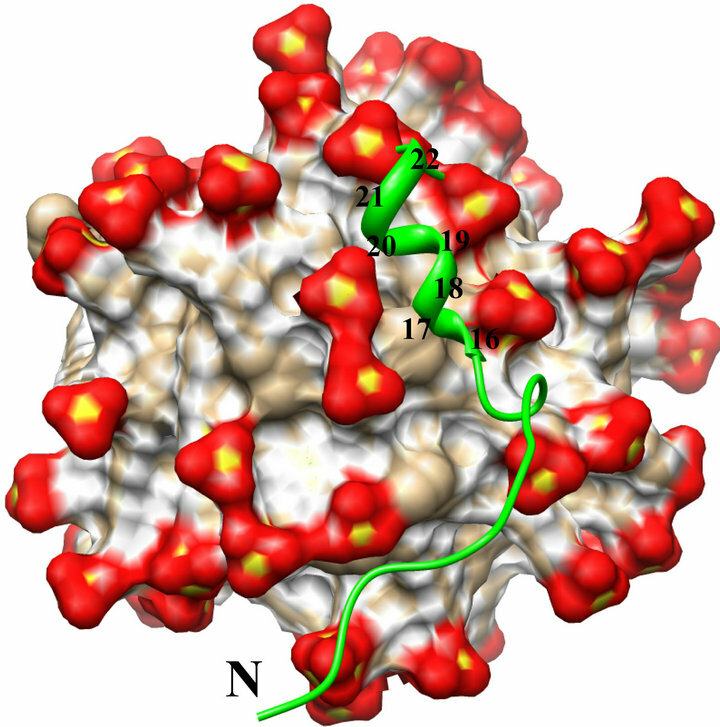 The first studies of protein-membrane complexes by NMR spectroscopy were of amphiphilic peptides, such as melittin , a peptide from bee venom with 26 amino acid residues, and d-hemolysin, a small peptide from Staphylococcus aureus. Both of these peptides are inclined to aggregate in aqueous solution [16,17]. Suitable models of cellular membranes for structural studies by NMR spectroscopy are micelles and micellar aggregates [18,19]. This has been shown in an NMR study (TOCSY, HSQC, HMBC, NOESY) of the spatial structure of a complex of the N-terminal domain of IIAGlc with micelles . This peptide is predominantly disordered in water, consistent with previous data obtained in the absence of membranes. In detergent micelles of dihexanoylphosphatidylglycerol (DHPG) or SDS, however, residues Phe3-Val10 of the peptide adopt a helical conformation in the ensemble of structures calculated on the basis of NOE-derived distance restraints. Table 1. 1H NMR chemical shifts of the Aβ1-40 in a phosphate buffer solution and in a solution of Н2О + D2O with SDS. Т = 293 K. In brackets are shown data of chemical shifts for Н2О + D2O with SDS solution. rather conform to the native lipid bilayer. These vesicles have a quite large rotation correlation time, tc~4 × 10–6 s.
Long correlation times result in small times of transverse relaxation, Т2, with further broadening resonance signals in NMR spectra and increase of spin-diffusion in 1Н NOE experiments . Short transverse relaxation times, Т2, lead to loss of information in 2D NMR experiments (TOCSY, HSQC, HMBC, NOESY), which is required to identify resonance signals and to characterize the spatial structure of proteins in complexes [22,23]. Thus, such particle sizes are not suitable for 2D experiments, and therefore, structural studies based on analysis of intramolecular 1Н NOE are restricted to molecules of large molecular masses interacting with small micelles surfactants. Surfactant molecules consist of hydrophobic and hydrophilic parts. Polar chemical groups of these molecules are located on the micelle surface, whereas no polar chemical groups are concealed in the micelle center . The CMC of a surfactant in solution is the minimal concentration of the surfactant at which the system forms stable micelles. In aqueous solution, micelles conduct like globular proteins containing around 60 amino acid residues with a rather small rotational correlation time (τc~5 × 10–8 s) . After a protein-micelle complex formation, the mass of the particle increases, which may lead to slower tumbling of the peptide in the micelle-bound form; and now, the NOE method can be used [22,23]. Micelles of SDS form in water at a concentration of 8.1 mM . Many proteins interact with SDS micelles at a weight ratio of 1.4 g of SDS to 1 g of peptide . In our experiments, micelles of SDS were used as a model of a biomembrane at the concentrations of SDS under conditions of micelle formation in water, which were determined by 1Н NMR spectroscopy . The positioning of Aβ in SDS was discussed in the study by Coles et al. and later was supplemented by Jarvet et al. . In the first work positioning was produced with respect to the membrane spanning segment of the APP, and in the second—by NMR spectroscopy combined with using paramagnetic 5-doxyl fatty acids and Mn2+ ions. This result supported one of the hypothetic positioning models of the Aβ1-40 in complex with the SDS micelle. 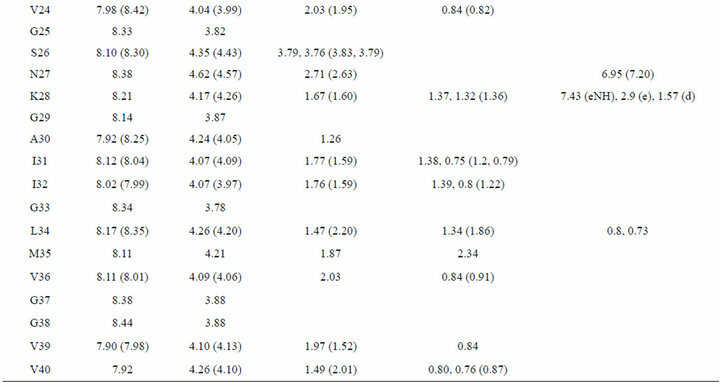 According to this data the central helix (residues 15 - 24) is significantly affected by 5-doxyl stearic acid however somewhat less for residues 16, 20, 22 and 23. Therefore this α-helix resides in the SDS headgroup region with the face with residues 16, 20, 22 and 23 directed away from the hydrophobic interior of the micelle . This discussion inspired the present study. In our work by chemical shifts changes value, NOE data and molecular dynamics method calculations a model of the Aβ1-40 in complex with the SDS micelle was obtained. 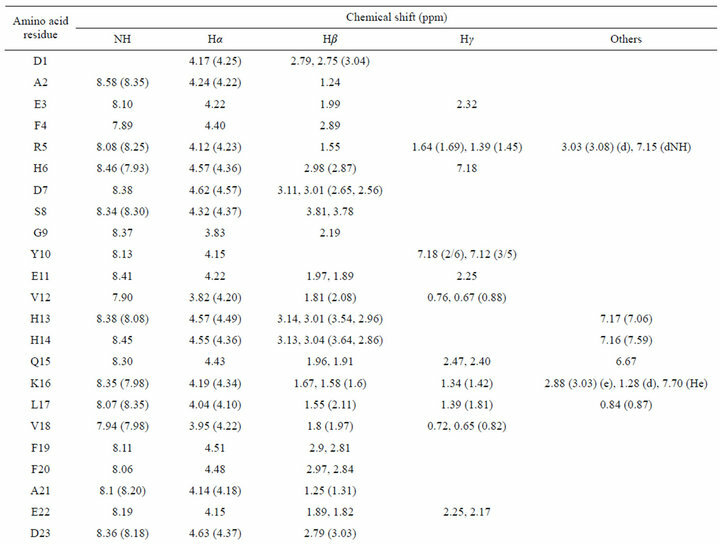 Comparing chemical shifts of the beta-amyloid in the solution of Н2О + D2O with SDS micelles (Table 1) and in the phosphate buffer aqueous solution, one can see a change in these values. The difference is probably due to changes in electrostatic environment brought about by the binding of the peptide to the micelle surface. Moreover, in the 2D 1H-1H NOESY spectrum of the beta-amyloid in the solution of Н2О + D2O with SDS micelles a significant increase of well resolved crosspeaks was observed (Figure 2). 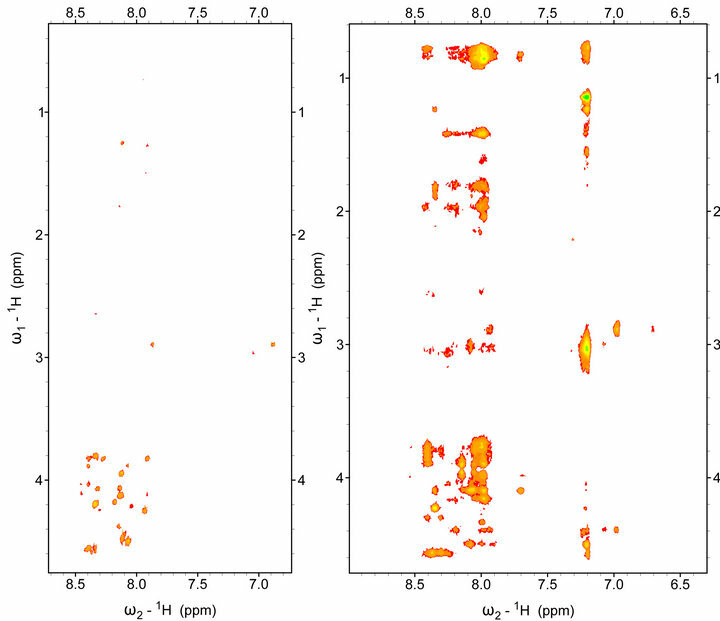 The presence of numerous well resolved cross-peaks in the NOESY spectra is an indication of increases in the mass of the particle, that is in our case, an indication of formation of a protein-micelle complex. To determine the interproton distances, which directly characterize the spatial geometry of peptide in solution, NMR NOESY spectra with varied mixing times (tm) were obtained. In Table 2, experimental interproton distances are presented. For calibration purposes, the intensity of the peak from the protons of the beta group of phenylalanine Phe20-(Hb1)-Phe20-(Hb2) was chosen. The distances between these protons were determined by different techniques and calculated to be 1.76 Å. To determine the spatial structure of beta-amyloid in a solution of Н2О + D2O with SDS the molecular dynamics method of the XPLOR program was used . These calculations allowed us to determine the most probable structure of conformer with the optimal structure of the beta-amyloid (Figure 3). A total of 57 intramolecular NOE distance constraints (Table 2) were determined for the structure calculations. None of the ten structures have any violated NOE distances. 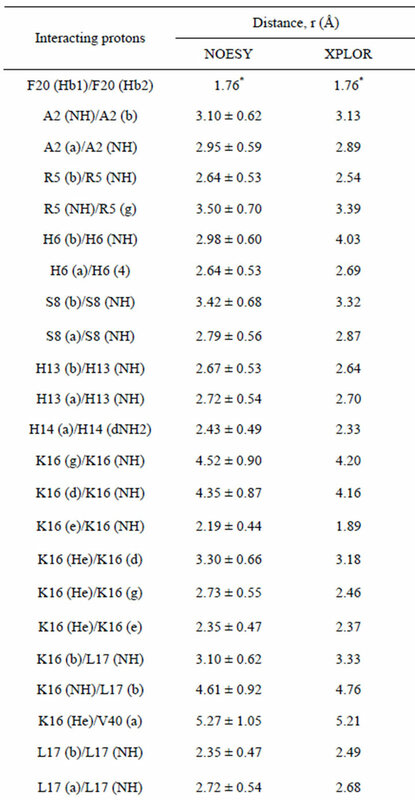 On the basis of the fact that chemical shift changes of the beta-amyloid 1H NMR spectra were observed in phosphate buffer solution and in complex with SDS micelles, a potential orientation of the peptide with respect to the micelle surface is suggested. It can be assumed that amino acid residues with 1H chemical shifts changed to upfield, are directed away from the hydrophobic interior of the micelle, which corresponds with a previous study [1,24-26]. Using the chemical shifts changes data and NOE data, together with the molecular dynamic calculations, a simulated structure of beta-amyloid Aβ1-40 in complex with a biological membrane model was obtained. Table 2. Experimental interproton distances for the beta-amyloid Aβ1-40 in a solution of Н2О + D2O with SDS micelles. Continued membrane environment (sodium dodecyl sulfate micelles). To determine the spatial structure of beta-amyloid in a solution of Н2О + D2O with SDS the molecular dynamics method of the XPLOR program was used On the basis of the fact that chemical shift changes of the beta-amyloid 1H NMR spectra were observed in phosphate buffer solution and in complex with SDS micelles, a potential orientation of the peptide with respect to the micelle surface. The work was supported by the Ministry of Education and Science of the Republic of Tatarstan (project No. 12-03-97040) and by the Ministry of Education and Science of the Russian Federation (KFU, code 2.2792.2011). Figure 2. Fingerprint region of 2D NMR 1H-1H NOESY spectrum of beta-amyloid Aβ1-40: (a) in 20 mM phosphate buffer solution; (b) in solution Н2О + D2O with SDS micelles. Т = 293 K. Mixing time tm = 0.2 s.
Figure 3. Simulated structure of beta-amyloid Aβ1-40 in complex with a biological membrane model. of J.C. and Seth M. Kempe for grants, from which equipment for the peptide synthesis and purification has been purchased. We also acknowledge Dr. S. Afonin for electrospray mass-spectrometry analysis of the peptide. Selkoe, D.J. (1995) Deciphering Alzheimer’s disease: Molecular genetics and cell biology yield major clues. Journal of National Institutes of Health, 7, 57-64. Jones, J. (2002) Amino acid and peptide synthesis. Oxford University Press, New York, 92. Filippov, A. (2010) Synthesis and aggregation studies on amyloid oligomers of Alzheimer’s abeta peptides. Lulea University of Technology, Lulea, 26. Wuthrich, K. (1986) NMR of proteins and nucleic acids. Wiley-VCH, New York, 1-292. Ernst, R.R., Bodenhausen, B. and Wokaun, A. (1987) Principles of nuclear magnetic resonance in one and two dimensions. Oxford University Press, Oxford, 610. Berger, S. and Braun, S. (2004) 200 and more NMR experiments. Wiley-VCH, Weinheim, 810. Usachev, K.S., Efimov, S.V., Yulmetov, A.R., Filippov, A.V., Antzutkin, O.N., Afonin, S. and Klochkov, V.V. (2012) Spatial structure of heptapeptide Abetha(16-22) (betaamyloid Abetha(1-40) active fragment) in solution and in complex with a biological membrane model. Magnetic Resonance in Chemistry, 50, 784-792. Hdoi: 10.1002/mrc.3880H. HSQC—Heteronuclear Single Quantum Coherence Spectroscopy. MALDI-TOF (Matrix-Assisted Laser Desorption-Ionization) mass spectrometry.